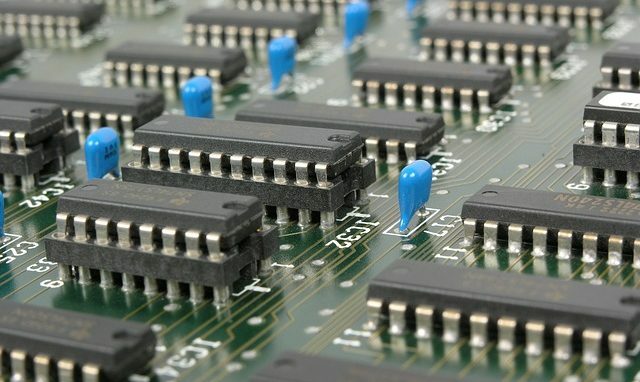 Home / Electronic Components / What is an Electronic Chip? An electronic chip is also known as an integrated circuit. It consists of components such as transistors, resistors and diodes which are all contained in one small plate. The plate will be made from a semiconductor material, most often silicone. It consists of many complex layers of semiconductor wafers, copper and any other required materials. Chips are very advanced and can sometimes contain billions of components in a tiny surface area. They have been around since the mid-20th century and modern technology has now made it possible to mass produce them using photolithography. Electronic chips are essential in modern electronics. They are fairly cheap to produce, and their performance can far outweigh that of a discrete circuit. The amount of information they can hold makes them perfect for constructing small yet powerful pieces of equipment, such as a computer. If a computer was built using the same kind of printed circuit board that might be used in other small electronic components, it would need to be enormous – 8 electronic switches would be required to store just one byte of information. Chips are used in numerous everyday devices and have transformed microelectronics. They can be found in satellite dishes, cars, computers, mobile phones and aeroplanes, to name but a few.